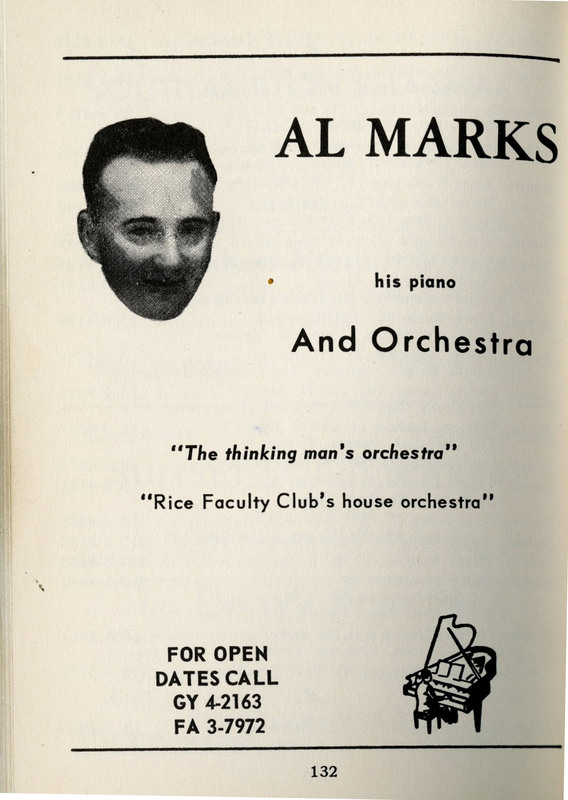 Even aside from the startling fact that the Faculty Club had a house orchestra, I don’t know what being the thinking man’s orchestra would entail. Here’s the story. Go read it! And another update from TikiOwl. What a story! I’m going to go add it to the post. Thank you! Great story, but “per say”? How did that get past an editor? I didn’t find any reference to it but I would guess they were a regular at the Tidelands club. Apparently GY4 numbers were used in Sharpstown until those numbers were moved to the even newer “PRescott” exchange. We had a MOhawk 7 exchange starting in 1956 so must have just missed a GYpsy number. Al is my uncle. His daughter, my cousin Martha Marks, is a Shepherd School alumna. His brothers-in-law are alumni, my father Isaac Dvoretzky and my late twin uncles, Louis and Edward Dvoretzky. Uncle Edward taught at Rice for some years, in the German department.